Son of Chicago’s Millennium Park! 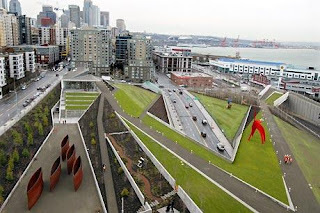 The Olympic Sculpture Park in Seattle opens this Saturday. 9 acres at the north end of the downtown waterfront. The Seattle Times has a fine web feature on the park here. “It’s not often in the life of a city that its identity transforms. Nickels pointed to Chicago’s Millennium Park as an example of how a city can blossom by providing world-class gardens, performance space, art and plenty of room to breathe in the heavily trafficked core of the city. Seattle’s new sculpture park, while much smaller, offers a sample of the amenities this city has been lacking. A meandering path bridges Elliott Avenue and a set of working railroad tracks to culminate in an alluring 850-foot strip of restored beach — the only slice of natural shoreline in downtown. You can see more than 20 major sculptures by Richard Serra (lower left in photo), Alexander Calder (right in photo), Claes Oldenburg, Mark di Suvero and Louise Nevelson, Louise Bourgeois and others. It’s owned and operated by (but not adjacent to) the Seattle Art Museum. Read Sheila Farr’s full story here. So far, I don’t think there’s any single work of art in there, as great as Chicago Millennium Park’s “Cloud Gate” but then, that would be asking a lot. You are currently browsing the archives for the Alexander Calder category.